For years I’ve been making popovers to go with our Thanksgiving dinner. In my opinion they’re the perfect bread to go with a heavy meal. They’re light, airy and delicious. My first encounter with popovers was while dining at The Zodiac Room in Neiman Marcus. I thought they were incredible and when I would take my children (now 22 & 25) with me, they loved them as well, especially slathered with their heavenly strawberry butter. Over the years I’ve perfected making these airy little puffs, getting rave reviews from all who try them. I get so many requests for this recipe I posted a video last year on my blog for the Thanksgiving holidays and decided I would post it again. I hope you enjoy my video. I’ve posted the full recipe below. I know you’ll love them, just as my family does. As always, if you have any questions while preparing these, don’t hesitate to contact me. I’m always happy to help. wow how tall those popover just popped! Thanks for the video too and I did enjoy it! Fantastic looking popovers! I’ve rarely seen them so tall. My wife is the popover baker in our house – but we haven’t made them for awhile. Time to have them again! The video is nice. Great post. Thanks. Wow! how beautifully they popped up. I enjoyed your video and I am thinking how can I make these gluten free. @Angie, Aarthi, Kitchen Riffs, and Lizzy – thank you for the popover compliment. I love making these and they really are so simple. Of course some of you know that already since you bake them. Also, I am unable to find your blog address since it’s not avialable on your profile. I’d love to visit your site if you could forward me your address or release it for others to see on your profile. Great instructions on how to make popovers! I can’t believe how tall yours are which proves you know what you’re talking about. 🙂 I made popover years ago, so it looks like it’s time to make them again because I LOVE popovers! Thanks for the inspiration. That’s it! I’m getting a popover pan. I’ve always been a bit intimidated by popovers but you make it sound so simple! Great tutorial! First thought when I read popovers on your title was Neiman Marcus Rotunda’s pop over with strawberry butter! I didn’t know the restaurant is called The Zodiac Room. I guess SF has different name? Anyway, I need to make popover pan… I really really love these and hope to make them at home! No wonder your family loves these – they are the Platonic ideal of popovers! I don’t have a popover pan but this just goes to show how important the right equipment is. Thank you Ann, mjskit, Cafe Sucre Farine,Nami & Trix for the nice comments about my popovers. Without question having a popover pan helps but if you don’t want to get one then by all means try them in a muffin pan. As some of you mentioned they looked intimidating but they really are quite simple. I hope you will try them. They are so much different than any bread you’ve ever had. They are hollow in the center, light and airy. Now THAT’S a popover. Beautiful. Great video, too, by the way! @ Cheryl and Adam – thank you! What beautiful popovers! Great job on the video too! I need to get a popover pan…. Those popovers are so gorgeous! Now I need a popover pan. 🙂 Thanks for the video- very helpful! These popovers look so lovely – great to have the video – I think they’re going on my Thanksgiving menu! Thank you for commenting on my blog and I’m so glad to have found yours – I’ve signed up to follow – looking forward to more! Your popovers came out beautifully! I’m with Lizzy I like to serve popovers with prime rib at Christmas. Vicki, I’d like to think that I’ve eaten a lot of popovers in m time, but I must say yours are the most beautiful ones I’ve ever seen. I really want to get me that special popovers pan now! 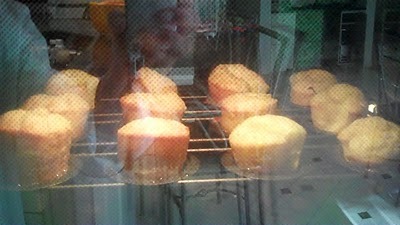 And your video looks great, it’s nice to hear your voice and also see how easy it is to make these popovers. Thanks so much for your encouraging and inspirational words. Motherhood and especially stay-at-home moms are generally under-appreciated but you are so right. Great kids who grow up into equally well-turned out adults are our ultimate reward! I’m hanging in there…:). I forgot to wish you and our family a happy Thanksgiving! Take lots of pictures of your spread and post them up for us to see ;-). Fantastic video, and recipe is simply awesome. Thank you for sharing it, I will have to try this as soon as I get that pan…Have a beautiful Sunday evening! Fantastic video Vicki…these are absolutely amazing! 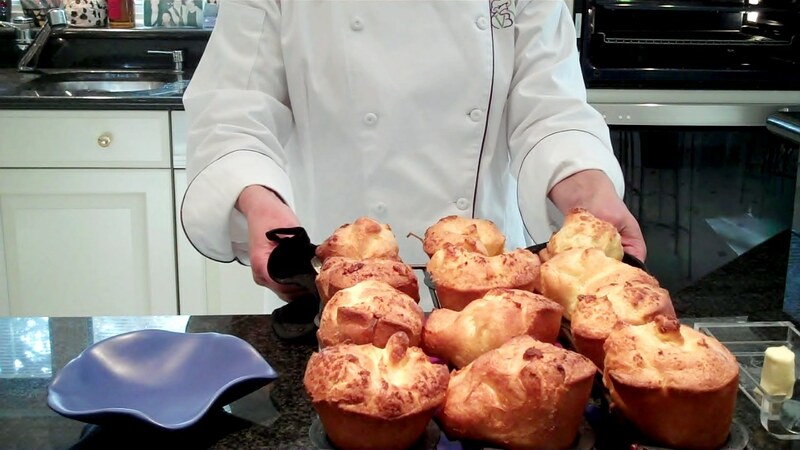 @Paccecopatty – It is challenging trying to get the popovers made just before the turkey goes out on the table but over the years I’ve mastered it. @Anne – thank you. I wish you lived closer as well. I’d love to come to your home and teach a class. @Balvinder – thank you for leaving your blog address. I just stopped by. @Foodiva – thank you for your comments and a Happy Thanksgiving to your family as well. I hope you get a popover pan and a Madeleine Pan so you can bake both. @Magic of Spice – thank you so much for your comments I’m happy you enjoyed my video. wow who could resist not trying these great video and they look amazing! Great timing forthe holiday!